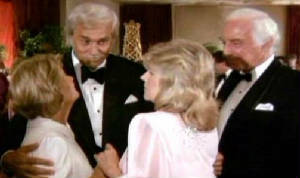 Below are pictures of Ellie Southworth Ewing Farlow. 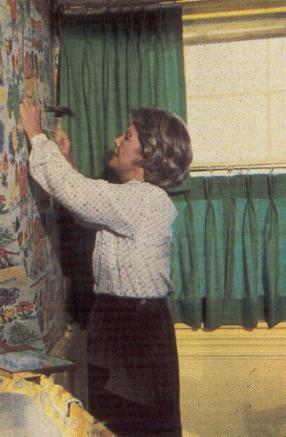 Miss Ellie (above) at the treehouse that Jock built for Bobby as a child. 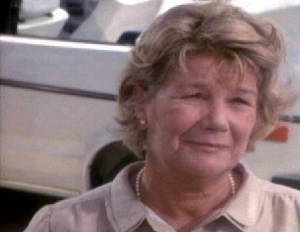 She visited the spot when Bobby died during what became known as the dream season. He was also buried there after his death. 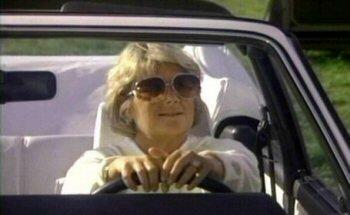 Miss Ellie with her white VW Rabbit. (above and below) She did not drive until Season 9 and this is the car that showed up out of nowhere. 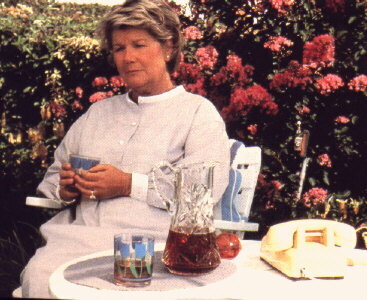 She never seemed to go into Dallas alone in her car. 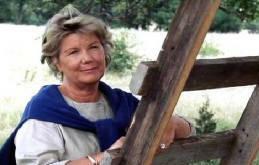 She was usually on the ranch or in Braddock. 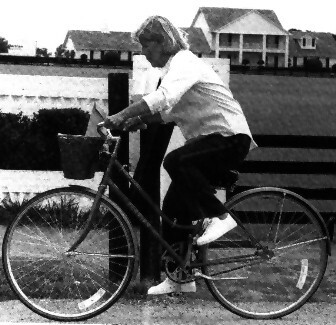 Miss Ellie riding her bike around Southfork before Jock's death (above) and Miss Ellie decorating John Ross' nursery (below). 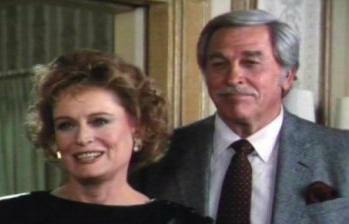 Below are pictures of Ellie and Jock Ewing during their 40 some years of marriage. 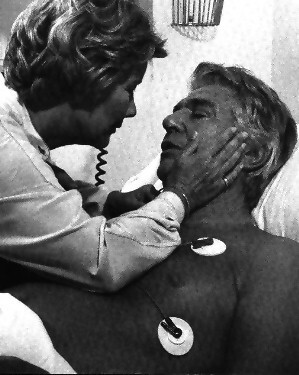 Ellie with Jock after his heart attack in late 1978 (above). 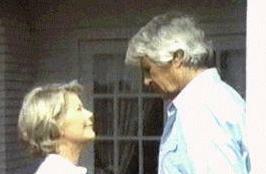 Below are pictures of Ellie and Clayton Farlow during their marriage. 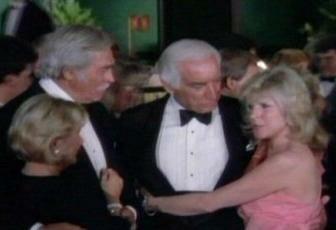 Ellie and Clayton with Mavis and Punk Anderson, their best friends (above and below). 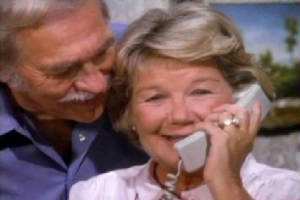 All of the pictures below are courtesy of The Howard Keel Online Scrapbook. 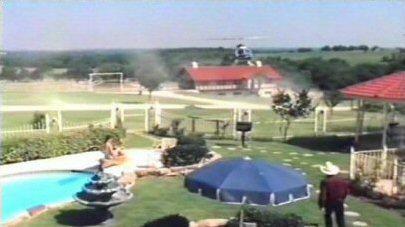 The Entarance of The Southern Cross Ranch (above) and an overview of the back of the Southern Cross Ranch (below). 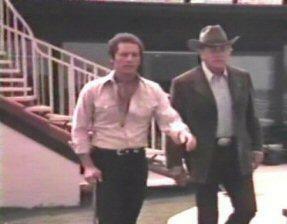 The Southern Cross was the home of Clayton Farlow until he feel in love with Ellie and decided to Dallas. 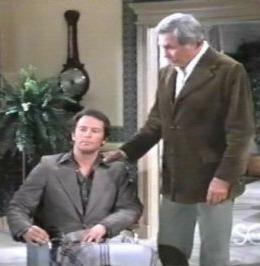 Clayton Farlow with his son, Steven "Dusty" Farlow (above) in Dallas when Suellen discovers Dusty is alive and in a wheelchair. 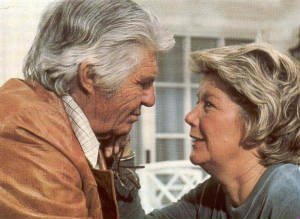 Clayton and Dusty (below) at The Southern Cross when Dusty is still walking with a cane. 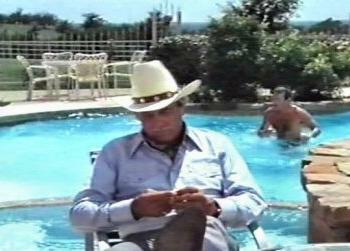 Clayton enjoying the Southern Cross (above) pool side. 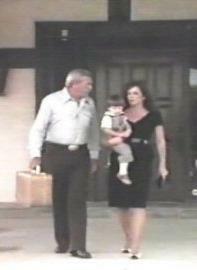 Clayton assisting Suellen as she leaves the Southern Cross with John Ross to go to Kristin's funeral (below). 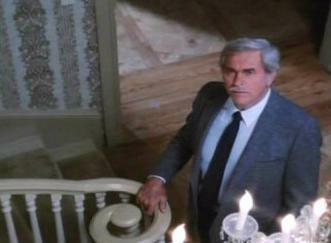 Clayton at the bottom of the stairs at Southfork before he has the big fight with JR (above). 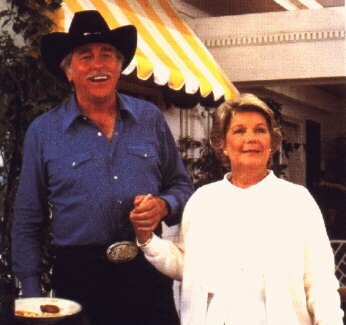 (Below) Clayton and his sister, Jessica Montford during her visit to Southfork for Clayton and Ellie's wedding. 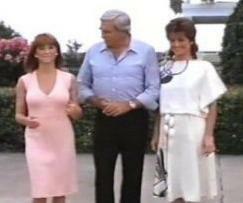 (Above) Clayton and with his step-daughters - in - law, Pamela (left) and Suellen (right) at Southfork.